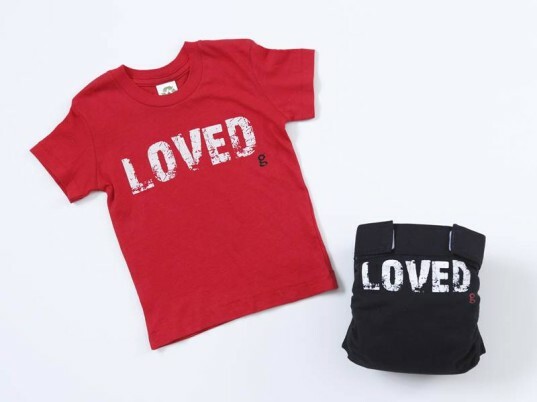 gDiaper‘s new, special limited edition Love Me gPants and g tee Love Me designs will melt your heart and keep your little one appropriately attired on Valentine’s Day and beyond. gDiaper is donating a portion of all proceeds from their love me gPants and g tees to Hands to Hearts International, an organization focused on improving the health and development of vulnerable children around the world by training caregivers in early childhood development and nurturing parenting skills. Thanks to Hands to Hearts, who began their work in orphanages in India, now baby and family love is flourishing in some of the world’s most volatile regions. Currently, this helpful organization serves India, Uganda, Swaziland, Russia and the United States and has trained more than 40,000 caregivers to date. When you purchase a gDiaper Love Me product, you’re directly helping to support the expansion of Hands to Hearts. Check out the gDiaper blog to learn more and keep reading to see more of the new Love Me collection. Like all little gPants, the new Love Me gPants are made with 92% cotton and 8% spandex for a gentle stretch and trim fit. Little disposable inserts that you can flush, tuck neatly inside each gPant to help keep messes in check or you can use the washable cloth diaper inserts for a more sustainable diaper experience. The adorable matching Love Me g tee is 100% cotton for a soft, comfy fit. Both the gPants and g tee come in bold black or red. gPants come in sizes that fit newborns to toddlers and the g tees fit babies 3 months to 2 years. A matching set is the perfect gift idea for your favorite baby (or parent) for Valentine’s Day, but hurry, because these lovable sets won’t last long. gDiaper's new, special limited edition Love Me gPants and g tee Love Me designs will melt your heart and keep your little one appropriately attired on Valentine's Day and beyond. gDiaper is donating a portion of all proceeds from their love me gPants and g tees to Hands to Hearts International, an organization focused on improving the health and development of vulnerable children around the world by training caregivers in early childhood development and nurturing parenting skills. Thanks to Hands to Hearts, who�began their work in orphanages in India,�now baby and family love is flourishing in some of the world�s most volatile regions. Currently, this helpful organization serves India, Uganda, Swaziland, Russia and the United States and has�trained more than 40,000 caregivers to date. When you purchase �a gDiaper Love Me product, you're directly helping to support the expansion of Hands to Hearts. Check out the gDiaper blog to learn more and keep reading to see more of the new Love Me collection.